Whether you find yourself in need of a new job due to a layoff or maybe you just need a little bit more wiggle room in your budget, finding a job to fit your schedule can be difficult. 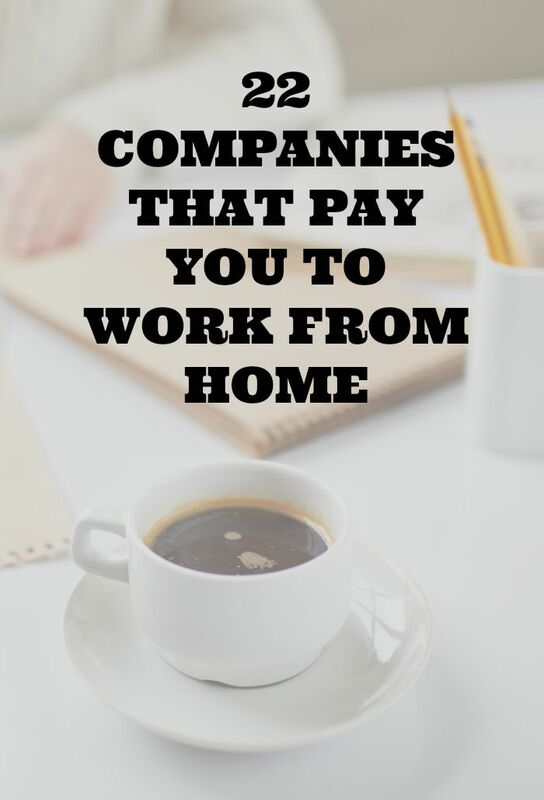 Thankfully, there are many legitimate companies who are looking for work at home employees. With most of these companies there is no special degree or schooling that is needed, although some may require training of some sort. Some jobs may be hit or miss and only pay a small amount, while others may be lucrative. You might find it beneficial to apply for multiple jobs and work for a couple of different companies at a time. 1. Speak Write - Are you a great typist? Start working with Speak Write to transcribe non-medical information on your own time. 2. About.com - About.com has nearly 1,000 different topic sites where they publish content and articles written by various different writers who earn cash for each article they produce. If you love to write and share tips with others, then this might be a good fit for you. 3. WiseBread.com - WiseBread.com hires personal finance experts to write articles for their site. 4. Wolfgang Research - Wolfgang Research hires court researchers courthouse research. You are paid by every valid record collected, which can vary. 5. VirtualBee - Virtual Bee is a data entry company that offers work at home opportunities. You are required to complete an evaluation before being considered for work. 6. U-Haul - U-Haul hires work at home call center agents to take incoming calls from their customers. You’ll be required to take reservations, provide roadside assistance and answer general questions. 7. HomeworkTutoring.com - HomeworkTutoring.com is just what it sounds like, they help tutor students with their homework by using a webcam. 8. ChaCha - ChaCha is a searching service that has a live person answering your search queries. They pay per answer which averages out to $3-9 per hour. 9. Virtually Yours 925 - Virtually Yours 925 hires virtual assistants to do word processing, data entry, administrative work and administrative work among other tasks. 10. WeGoLook.Com - WeGoLook.com allows you to perform customer service tasks online and off. 11. 1800Flowers.com - 1800Flowers.com hires work at home call center agents. Most positions are on a temporary or seasonal basis. 12. Amazon.com - Work for Amazon.com as a home-based customer service agent. Search "work from home" in the keyword field. 13. eJury.com - Signing up as a juror through eJury.com is just like acutal jury service and you would be evaluating a lawyer's case. 14. Neiman Marcus - Become a seasonal work at home call center agent through Neiman Marcus. 15. Scribie - Scribie hires freelance transcriptionist to transcribe files that are usually 6 minutes or less and are paid per audio hour. 16. VITAC - VITAC employees are court reporters who caption live TV programming. 17. Axion Data Services - Axion is a data entry company that pays on a per-piece basis. 18. Examiner.com - Examiner.com is another site that hires writers, with knowledge about local events and communities. 19. QuickTate - QuickTate is a transcription company, that transcribes voicemail messages, memos, letters, recordings of phone calls, conference calls and other audio files. Some files may be just a few minutes while others may be a few hours. 20. Patch.com - Patch.com is an online news source that hires work at home editors, writers and sales staff. 21. Amazon's Mechanical Turk - Amazon also has a micro job site, MTurk, which is basically a crowdsourcing marketplace that uses “human intelligence” of independent contractors to complete tasks. 22. CrowdSource - Crowdsource also offers various micro jobs such as writing, editing or something as small as tagging a picture. Have you tried working for any of these companies? What has been your experience? I have worked for a month for Examiner.com. Till my ex-daughter-in-law found me on there and started harassing me. So I had to quit.